We have seen a copy of The Uganda Gazette dated June 8, 2017 where the Constitution (Amendment) Bill is listed as one of the bills that are due to be published. Sources said the bill shall be published in the gazette in a few weeks' time. Interviewed for a confirmation on Friday, June 30, Maj Gen Kahinda Otafiire, the minister of Justice and Constitutional Affairs, said the Constitution (Amendment) Bill 2017 awaits to be published in The Uganda Gazette before it can come to parliament for debate. The Uganda Gazette, according to the ministry of Justice's website, is the "official newspaper of government." Otafiire said: "Once the bill has been gazetted, a Constitutional Review Commission shall be appointed and it will gather views from the people." Otafiire added that all articles of the Constitution, including 102 that touches on the qualifications for one to be a president,will be up for possible amendment. "What is so special about Article 102? Is it a commandment from God? If the public wants the age-limit amended, it will be amended. If they don't want, we shall leave it," Otafiire said. Specifically, Article 102 (b) states that a person is not qualified for election as president of Uganda if he or she is "less than thirty-five years and or more than seventy-five years of age." The fiery minister continued: "The Constitution is not my property. I am just a custodian. If people want some articles to be amended, it is their right." Otafiire's remarks confirm earlier speculation that government plans to have the presidential age cap abolished despite public denial by senior government officials. 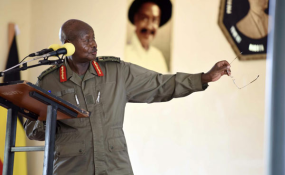 In a 2012 interview that is now commonly shared on social media, President Museveni told NTV: "I don't think someone can be an effective leader after 75 years." However, since his re-election last year, the president has been more circumspect, simply telling journalists that he will follow the Constitution. Some politicians, seeking to catch his attention, have already stoked the potentially fiery debate. In August 2016, the Kyankwanzi district leadership drafted a resolution in support of an amendment to lift the age-limit. Led by Woman MP Ann Maria Nankabirwa, the resolution was handed to a smiling President Museveni after a meeting of both parties. Later on, it was Robert Kafeero Ssekitooleko's turn to catch the president's attention. In September 2016, the Nakifuma MP tried in vain to table a private member's bill that was seen as a ruse to lift the presidential age limit in the Constitution. On the face of it, the bill aimed to raise the retirement age of judges and give electoral commissioners an extended tenure but, under the surface, it was believed to be targeting Article 102(b). The Nakifuma MP's move collapsed on September 13, 2016 after Speaker of Parliament Rebecca Kadaga directed that the motion be shelved until government tables an omnibus bill with all constitutional amendments therein. Ssekitooleko is now understood to be part of a group of MPs actively working to figure out how the age-limit clause can be set aside. Others, according to our sources, are, John Bosco Lubyayi (Mawokota South), Simeo Nsubuga (Kassanda South), former FDC treasurer Anita Among (Bukedea Woman), Arinaitwe Rwakajara (Workers), Peter Ogwang (Usuk) and Jacob Oboth-Oboth (West Budama South). Asked about the Constitution (Amendment) Bill, Rwakajara told The Observer on Saturday that he will support it when it comes to parliament. "Let it come to parliament and we see the details. I will support it," Rwakajara said. Yet any attempt to lift the age-limit will most likely set off protests from some sections of the public, opposition groups and civil society activists. Godber Tumushabe, the executive director of the Great Lakes Institute for Strategic Studies (GLISS), told The Observer on Saturday that government's insistence on pushing forward with the amendment shows they don't have the interests of citizens at heart. "This government no longer works for the people. It works for itself and President Museveni. What Museveni wants is what becomes law," Tumushabe said. Betty Nambooze, the Mukono municipality legislator, told The Observer last week that the opposition would rise up against any attempt to lift the presidential age-limit. "I call upon all well-meaning Ugandans to join us in the struggle against dictatorship. We shall not sit by and watch as Museveni tampers with the Constitution."